The HAM radio network, which serves the Wilmington, Ohio forecast area, is set up to facilitate a four stage process. The front lines are the HAM radio operators (HAMs) in the field. 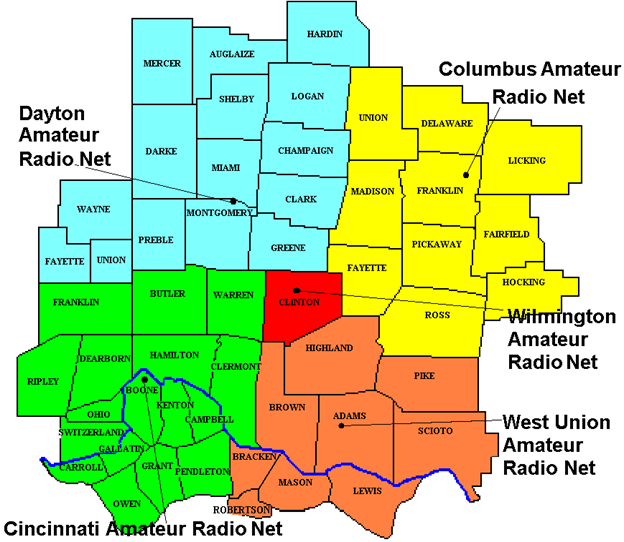 HAMs will radio in their reports to their regional net controller in either Dayton, Columbus, Cincinnati, or West Union. These net controllers will then relay the information to the Wilmington net controller. The Wilmington net controller will then pass the reports to the operational staff at the National Weather Service. The Wilmington net control station is located in the NWS building near the operational floor. A map showing how counties and the regional net controllers are divided up can be seen below.